For other uses, see Becontree (disambiguation). 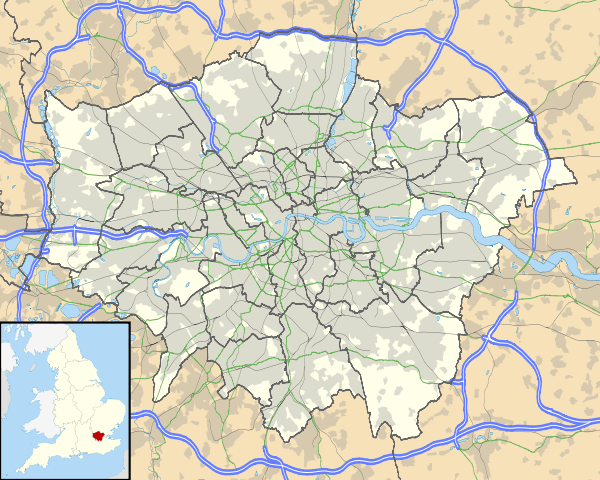 Becontree /ˈbɛkəntriː/ is a large housing estate of approximately 4 square miles (10 km2) in the London Borough of Barking and Dagenham in East London, England. It is located 11 miles (17.7 km) east-northeast of Charing Cross and was constructed in the interwar period as the largest public housing estate in the world. The Housing Act 1919 permitted the London County Council to build housing outside the County of London and Becontree was constructed between 1921 and 1935 to cottage estate principles in the parishes of Barking, Dagenham and Ilford in Essex. The official completion of the estate was celebrated in 1935 with a population of around 100,000 people in 26,000 homes. The building of the estate caused a huge increase in population density which led to demands on services and reforms of local government. An additional 1,000 houses were added in later phases. The estate initially had no industrial and very little commercial development until the May & Baker and Ford Dagenham sites opened nearby, and a shopping area was built at Heathway. The estate has formed part of Greater London since 1965, when the Barking section was combined with Dagenham, and has been within a single London borough since the Ilford section was transferred to Barking and Dagenham in 1994. The estate is named after the ancient Becontree Hundred, which historically covered the area and is recorded in the Domesday Book of 1086. The name is Old English and means 'tree of a man named Beohha'. The tree would have stood on Becontree Heath, just outside the eastern boundary of the estate. The majority of the estate was in the parish of Dagenham and the whole estate is in the Dagenham post town, and the two names are used interchangeably. Because of the lack of available land in the County of London, the Housing Act 1919 permitted the London County Council (LCC) to build housing and act as landlord outside of its territory. G. Topham Forrest was the chief architect of the LCC. 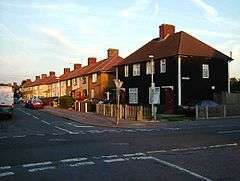 Becontree was developed between 1921 and 1935 by the LCC as a large cottage estate of around 26,000 homes, intended as "homes fit for heroes" after World War I. The very first house completed, in Chittys Lane, is recognisable by a blue council plate embedded in the wall. The construction was an enormous civil engineering project; a special railway was built especially for the building work, connecting railway sidings at Goodmayes and a wharf on the river Thames with the worksites. The building of the estate took longer than anticipated. The LCC hoped to build 24,000 homes by 1924. They were only able to achieve 3,000 and the works were extended into three phases lasting until 1935. On 13 July 1935 the official completion of the estate was celebrated with the ceremonial opening of Parsloes Park by MP Christopher Addison. However, the demand for housing meant that a further 800 homes were built in 1937. With a population of 115,652, it was the largest public housing development in the world. After the Second World War, between 1949 and 1951, 600 houses were built by the LCC in Dagenham in an area adjacent to the estate called Heath Park. The LCC built the estate to rehouse people from London's East End, due to slum clearance. However, the residents were almost all relatively prosperous working class, such as factory workers and busmen. At the time everyone marvelled at having indoor toilets and a private garden, although the sash windows were extremely draughty, there was no insulation in the attics, and during the winter months very few people could afford enough coal to heat the bedrooms. The toilet, bath tap and a tap in the kitchen over a copper boiler which was used for both washing clothes and heating bath water were all fed from a reservoir tank in the attic which invariably froze on winter mornings leaving the toilets unusable. One clause in the contract of tenancy stipulated that children born to parents living on the estate would not be housed by the LCC and when the time came for them to establish their own homes, the relevant local authority would be expected to provide housing. Privet hedges (referred to as "evergreens" or "evers") were planted along the pavements at the end of every front garden and during the spring and summer months a squad of gardeners were employed to keep them in regulation height. Although the estate regulations stipulated that the gardens must be maintained in order, more than a few degenerated into virtual jungles. However, to encourage the application of this rule, prizes were awarded for the best kept gardens. Initial candidates were selected by the rent collectors during their weekly rounds and a committee decided on the final prizes which ranged from ten shillings consolation prizes up to £20 (an average week's rent in 1953 was about £1 18/- (£1.90)) for the first prize in each ward, plus a notice placed in the centre of the lawn for the benefit of passers-by. When built, the development occupied parts of the parishes of Barking, Dagenham and Ilford, with administration split between the three respective urban district councils. Barking and Ilford were established as suburbs of London and had been urban districts since 1894. Dagenham was almost entirely rural until the building of the estate, having a population of only 9,127 in 1911 and growing to 89,362 in ten years. It gained urban district status in 1926. Approximately 50% of the estate was in Dagenham, 33% in Barking and 17% in Ilford. Ilford was incorporated as a municipal borough in 1926, Barking in 1931 and Dagenham in 1938. Services such as education and libraries were provided by Essex County Council throughout the estate. However, the division of responsibilities allowed for the local councils to provide elementary education in their areas as their populations were high enough. [notes 1] Before the Second World War Barking and Ilford, but not Dagenham, were providing elementary education. However, Dagenham was permitted to provide its own library service. After the Second World War Dagenham also provided elementary education. During the 1920s and 1930s there was periodic discussion and review of the local government arrangements in the area, including proposals to merge the three districts, or transfer the estate to the County of London, but it was not acted on. The area was within the Metropolitan Police District. It was considered to form part of the Greater London conurbation for census reporting and in 1957 formed part of the review area of the Royal Commission on Local Government in Greater London. The 1960 report of the commission recommended that Barking and Dagenham should form as a single London borough and this became the London Borough of Barking in 1965 following the London Government Act 1963. Ilford became part of the new London Borough of Redbridge. Barking was renamed Barking and Dagenham in 1980. 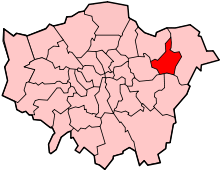 It was anticipated that the mergers of existing boroughs might produce unsatisfactory boundaries in some places and a Local Government Boundary Commission for England was established by the Local Government Act 1972 to review periodically the boundaries of Greater London and the London boroughs. The first review of boundaries in London commenced on 1 April 1987 and reported in 1992. The transfer of the Redbridge part of the estate to Barking and Dagenham had broad support. Following the review, in April 1994 an area of 90 hectares with a population of 200, was transferred from Redbridge to Barking and Dagenham, and a new ward of Becontree electing two councillors was created. The wards and councillor allocations were redrawn in 2002. All houses were supplied with gas by the Gas Light and Coke Company, most had gas lighting and some were fitted with electric lighting. Electricity was supplied by the County of London Electric Supply Company in Dagenham and the electricity services of Barking and Ilford municipal corporations in those sections. All gas lighting was converted to electricity in 1955. Water supply in the whole estate came from the South Essex Waterworks Company, but sewerage was split on municipal lines. In 1930 Barking and Ilford formed the Ilford and Barking Joint Sewerage Committee. The General Post Office placed the entire estate in the Dagenham post town, including the Barking and Ilford sections, giving all residents postal addresses of "Dagenham, Essex". It is perhaps for this reason that Becontree and Dagenham became synonymous. In 1927 the LCC was reluctant to agree that the Postmaster General should provide subscriber telephone lines to the estate, as it was considered incongruous for residents of a subsidised housing scheme to be able to afford such a luxury. Lines were connected from nearby exchanges until the DOMinion exchange was opened within the estate. In 1954 it had 1,337 lines, increasing to 1,620 in 1955 and by 1958 it had 2,700 lines. The original LCC plan anticipated a civic and commercial centre around Parsloes Park. However, LCC was only a landlord in the area and had limited ability to influence commercial development and had no control over local government. The plan was not followed and Dagenham Civic Centre opened in 1937 outside the eastern boundary of the estate. The lack of a conventional town centre meant residents used the existing centres at Barking and Ilford. Small parades of shops were provided throughout the estate, such as on Gale Street and Wood Lane, but Dagenham Urban District Council tried to make up for the lack of a high street by creating a commercial centre along Heathway in 1934. The estate was built without any provision for car parking as it was not anticipated that tenants would own cars. The plot sizes did now allow for garages to be added to homes. The LCC provided eleven garages for rent in 1937 and a further eighty in 1951. The LCC planned a tramway through the estate, filling some of the wide spaces on roads left by the special railway, but it was never built. There were no railway stations within the boundaries of the estate, with Chadwell Heath, Dagenham, Dagenham Dock and Goodmayes a short distance away. The Fenchurch Street–Southend line of the LMS passed through the estate, without stopping. In response the LMS provided Gale Street Halt on the line in 1926. In 1932 the line was doubled with the addition of two electrified tracks. Gale Street Halt became Becontree station and a new station was added at Heathway. The stations were primarily served by the District Railway of the London Underground, which was extended from Barking to Upminster. Over the 15-year period of the building of the estate, the school-aged population rose rapidly to 25,000 while there were only 4 secondary schools nearby: 3 in Chadwell Heath and 1 at Becontree Heath, which meant that many children could not attend school. The first secondary school to be built was "Green Lane" in 1923, but it later became a primary school. It was renamed "Henry Green" in 1953, after the first headmaster after the secondary school opened in 1925. Another improvement was after the 1957 smog, when the estate was declared a smokeless zone. The houses had their old fireplaces converted for use with smokeless fuel, which included fixed gas pokers in the hearths. The elderly man and his wife who lived in Mill Lane, Chadwell Heath and toured the estate in a horse-drawn cart on Saturday mornings selling logs and firewood (mostly tarred wood taken from the East End roads when they were replaced by tarmac) saw their business collapse overnight. The estate had no industrial and very little commercial development planned to support the population. Initially residents commuted to Inner London for work, until the May & Baker and Ford Dagenham sites opened nearby. According to the 2011 census, White British was the largest ethnic in Becontree ward at 51%. The second largest was Black African, at 13%. In addition, the Parsloes ward which also covers parts of Becontree was 61% and 14% respectively. The estate is within the Becontree, Eastbrook, Goresbrook, Heath, Mayesbrook, Parsloes, River, Valence and Village wards of Barking and Dagenham. Each ward elects three councillors to Barking and Dagenham London Borough Council. 25 of the councillors are Labour Party members, one is a member of the Conservative Party and one is independent. Approximately half of all the borough councillors are elected from wards covering the estate. East London has a long history of brass bands, and Becontree Brass Band was founded in 1981 as an amalgamation of several local bands. The Dagenham Girl Pipers were formed in 1930 as the first female pipe band in the world and are still in existence. Nearest tube stations are Becontree tube station, Dagenham East tube station and Dagenham Heathway tube station. Nearest railway stations are Chadwell Heath railway station and Goodmayes railway station. ↑ This was known as a 'Part III authority' under the Education Act 1902 and an 'excepted district' under the Education Act 1944. ↑ Mills, D. (2000). Oxford Dictionary of London Place Names. Oxford. ↑ "Homes For Heros". Locallocalhistory.co.uk. 2008-01-13. Retrieved 2016-11-24. 1 2 "Dagenham: Introduction and manors | British History Online". British-history.ac.uk. Retrieved 2016-11-24. ↑ "LONDON COUNTY COUNCIL (MONEY) BILL (By Order) (Hansard, 22 May 1957)". Hansard.millbanksystems.com. Retrieved 2016-11-24. ↑ Alan A. Jackson, Semi-Detached London: Suburban Development, Life and Transport, 1900-39, London: Unwin, 1973, ISBN 978-0-04-902003-0, p. 115. 1 2 3 Robson, William (2007). The government and misgovernment of London. London New York: Routledge. ISBN 0415418267. ↑ "The East London Boroughs (London Borough Boundaries) Order 1993". Legislation.gov.uk. Retrieved 2016-11-24. ↑ "The London Borough of Barking and Dagenham (Electoral Changes) Order 2000". Legislation.gov.uk. Retrieved 2016-11-24. ↑ Willmott, Peter (1973). Family and class in a London suburb. London: Routledge & Kegan Paul. ISBN 071003914X. 1 2 Andrzej Olechnowicz, Working-Class Housing in England Between the Wars: The Becontree Estate, Oxford historical monographs, Oxford: Clarendon/Oxford University, 1997, ISBN 978-0-19-820650-7. ↑ "Telephone Service, Dagenham (Hansard, 2 February 1955)". Hansard.millbanksystems.com. Retrieved 2016-11-24. ↑ "Dominion and Rainham Exchanges (Hansard, 26 March 1958)". Hansard.millbanksystems.com. 1958-03-26. Retrieved 2016-11-24. ↑ Cherry, Bridget (2005). London. New Haven, CT London: Yale University Press. ISBN 0300107013. ↑ Jackson, p. 290 and Plate 22, opposite p. 321. ↑ Jackson, p. 299: "Before [September 1923], with virtually no places available in existing schools, the children of the Becontree tenants ran wild all day, no doubt having a marvellous time". ↑ Porter, Roy (2000). London : a social history. London: Penguin. ISBN 014010593X. ↑ Good Stuff IT Services. "Becontree - UK Census Data 2011". Ukcensusdata.com. Retrieved 2016-11-24. ↑ Good Stuff IT Services. "Parsloes - UK Census Data 2011". Ukcensusdata.com. Retrieved 2016-11-24. ↑ "Your Councillors". Moderngov.barking-dagenham.gov.uk. Retrieved 2016-11-24. Wikimedia Commons has media related to Becontree.